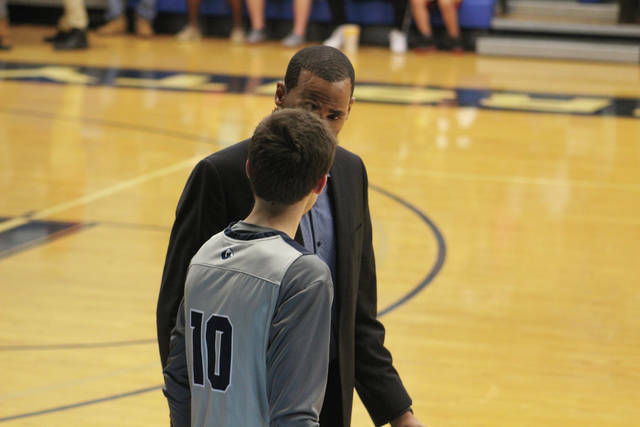 Shawnee State’s DeLano Thomas talks to Gavin Brown during a stoppage in play on Thursday evening against Campbellsville. Shawnee State’s Daniel Ester during a break in the action. Video highlights of SSU’s 86-84 victory over Campbellsville. It takes a lot for a basketball coach to believe a game is over. That’s why sometimes you see coaches calling for late timeouts, trying to push out every last second on the clock. Coaches feel that their team is always still in a game. Good coaches pass that attitude over to their players, who in return never give up out on the floor. 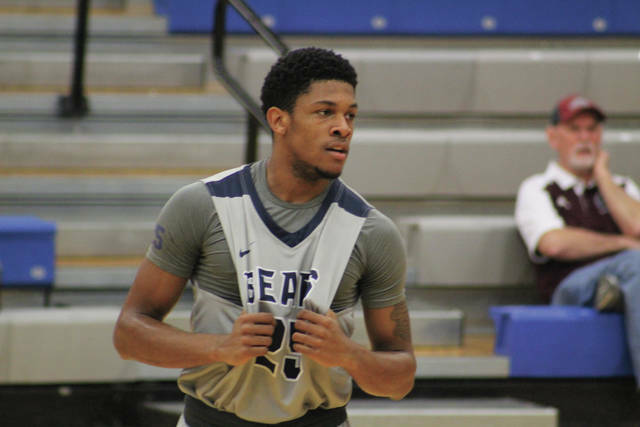 Shawnee State showed that stick-to-itiveness on Thursday night in an 86-84 win over Campbellsville, in a game that they trailed by nine points with 9:19 to play. Moore got the job done for his team, leading the way with 18 points. The senior would score the last nine points of the night for Shawnee State, aiding a comeback attempt for the Bears. Still, Moore gives all the praise to his coaches and teammates. All in all, it was an overall team effort for Shawnee State. Fans were treated to a wonderful outing at community night. The event was special for Thomas, who played and graduated from SSU. The game wound up being an instant classic as well, with seven ties overall and 20 lead changes. It was a contest that went back and forth throughout the entirety of the game, with tons of ups and downs. Neither side was able to build any notable energy early, until Campbellsville sparked up a run midway through the first half. Trailing 27-21 with eight minutes before halftime, Thomas took a timeout to rally the troops. Out of the huddle, the Bears burst down the floor as former Portsmouth Trojan Jayllen Carter gained separation with a nice behind the back dribble. Carter then splashed a shot from 15 feet out to cut into the lead. Two minutes later, Shawnee State tied the score when Valley graduate Bryan Rolfe stuck a three-pointer to tie the game at 31. The Tigers took off a few more times before the break, but the Bears continued to answer. At halftime, Campbellsville was ahead by just one, 43-42. Justin Johnson had 11 points in the first half for Shawnee State. Johnson’s length and ability to stretch the floor was problematic. Once Johnson got within range of the rim, his scoring attempts seemed effortless. Matt Rhodes also was a lift for the Bears, posting nine points on three made three-point shots. For the Tigers, Shawn Johnson and Hagen Tyler had eight each at the half. Both teams kept the battle coming at one another in the second. With each school vying for momentum, it seemed the game would go to whoever could pull ahead with a late run. When the Tigers got a score from Tyler off a steal with 13:50 to play, they were still behind by three. But from there, they began a 16-2 scoring streak which included 12 unanswered points. After the run was all said and done, Campbellsville was ahead 73-64 with 9:28 left in the game. Thomas had been encouraging his team every time he had the chance to, hoping his inspiration would carry over to the court. The comeback hopes began to look even more bleak with 1:33 to play after a pair of Adam Stanford free throws made the score 81-77 Tigers. Not backing down, Shawnee State stormed back in a hurry. Watkins charged the rim hard on a drive, and when he drew defenders quickly kicked the ball softly to the hands of Moore for a dunk. Then, in a blink, Watkins stole the inbounds pass and instinctively drilled a pass to the hands of Moore again for an identical slam. The second Moore dunk tied the game at 81 with 1:12 to play. Out of a timeout, Campbellsville was unable to create a scoring opportunity and the ball went back to the Bears. Watkins again found Moore with position in the post, and Moore caught the pass and kissed it off the glass. All the while, Moore had been fouled, but the contact didn’t phase him and his shot fell with 24.9 seconds to play. Moore’s made free throw made the score 84-81 Shawnee State. The Bears would close out the game on a pair of Moore free throws, winning 86-84. It was a huge victory for the team in what has been a grueling conference schedule this season. With the conference tourney looming, Moore hopes he and his team can continue the success they had against Campbellsville. “We’ve got three games until we go into the tournament, and we’re going to try and play our best basketball going into tournament so we can make a good run for us,” Moore said. The Bears will close out their home schedule with a game against No. 11 Georgetown on Saturday, with tip-off scheduled for 4 p.m.
Video Caption: Video highlights of SSU’s 86-84 victory over Campbellsville.